MORE FRIDAY NIGHT lights could be on the horizon as organisers of an American football tournament staged in Ireland last month say they are already working on a follow-up event. More than 13,000 spectators attended matches as part of the Global Ireland Football Tournament, played on the eve of the Emerald Isle Classic between Notre Dame and Navy in the Aviva Stadium. Twelve high school and college teams from the United States, Canada and the United Kingdom played six games split between Donnybrook Stadium and Parnell Park in Dublin and Páirc Tailteann in Navan. Declaring the tournament “an unprecedented success”, GIFT organisers said that they are working on a “spectacular follow-up” to take place in either 2013 or 2014. “The entire event required an amazing team effort on the part of hundreds of dedicated people, but it all started – and ended – with the visionary commitment of each of the schools’ leaders,” Patrick Steenberge, Global Football president and GIFT organiser said. An estimated 2,500 travellers visited Ireland for the GIFT event, worth in the region €4.5 million to the Irish economy. 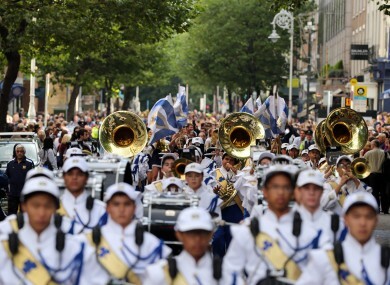 As well as the six matches, the programme of events also included a parade through Dublin city centre, a pep rally in Trinity college and open practice sessions for the public. Email “Irish return planned for American football tournament”. Feedback on “Irish return planned for American football tournament”.